Making a coffee buying decision is essentially about two important things, price and taste. Yes, service and availability also come into it for sure, but let’s come back to that. Here is what we at Cutman & Hawk are able to promise you. PRICE: We have saved many businesses thousands of Rand per annum. Our pricing is competitive due to being a small locally owned, owner managed business. We are based in the Eastern Cape. We don’t run fleets of vehicles or employ hundreds at a head office. We keep our overheads to a minimum. We would appreciate an opportunity to bid for your business, you really have nothing to lose. TASTE: We can proudly boast that, with 1000’s of blind taste-tests behind us over many tears, we have yet to come second! Provided we pass the “price test” and you are ready to convert, we will gladly chat to you about a free tasting. QUALITY: We do not even stock low cost Arabica extenders, certainly not Robusta (a commonly used low cost extender found in many commercial coffees). Our blends are made up of the finest high grown Arabica beans and have passed the taste test of even the most discerning coffee lover. Tried and trusted. DARE-TO-BE-DIFFERENT: A successful business needs to have a competitive advantage over their opposition. If everyone is using the same-old, same-old popular brand, one that is available in every supermarket, what makes you different? Cutman & Hawk can help you take your customer offering to another level. EQUIPMENT AND BACK-UP: Yes, we offer a comprehensive range of coffee equipment, from plungers up to the most advanced coffee machines in the world. We offer these on our somewhat unique rent-to-own basis or outright sale and NO, we don’t HIDE so called “free-machines” in the price of our coffee. With our rent-to-own the machine will become your asset. To find our more about our coffee click here and to find our more about our rental service for business clients, click here. To buy-online please click here. Alan, a coffee lover for too many years to remember, is our roaster. We have two roasters, one with a 6 kg batch capacity, one with 15 kg, at approximately 80 kg per hour, this enables us to make sure that all our coffee arrives at your door as fresh as possible via our overnight delivery service. 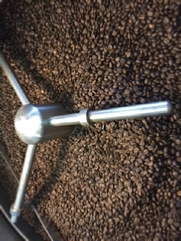 From roaster to your door! Coffee is a foodstuff and yes, it too gets stale! Thank you for giving a fellow Eastern Cape business an opportunity to bid, that’s all we ask.